Overall, an excellent trail race. I want to make special note that this race was completely free and was put on by Runnin' Gear and Rotpac Racing. 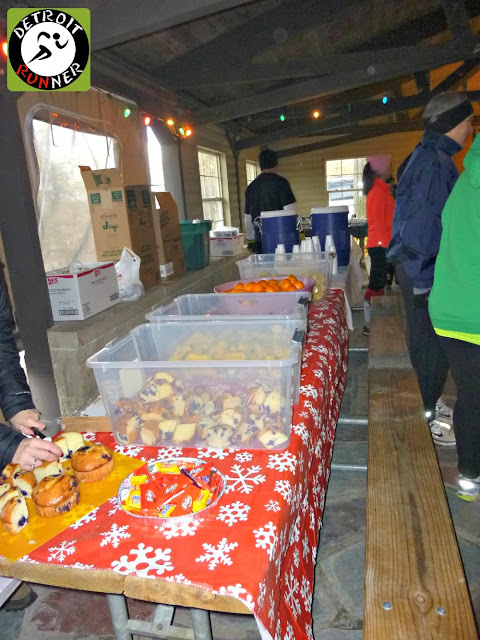 The race offered a professionally timed race, a planned 5k course on the trails, food and drink after and prizes. How could you go wrong with that? Count me in! Because it was a free race, all you had to do was e-mail Rotpac Racing with your information and you were registered. 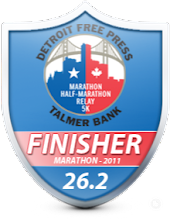 They even listed the race on RunMichigan too which spread the word and posted results on there as well. Packet pickup was the day of the race. We got there about 8:30 since there was a line to get into the park. 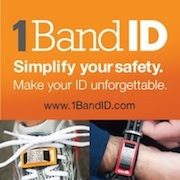 Actually since it was free, all you needed to do was pick up your race bib and timing tag. The race gave you a chip to go on your shoe. Josh offered to drive me and my sister in law since he had a park pass which was nice. 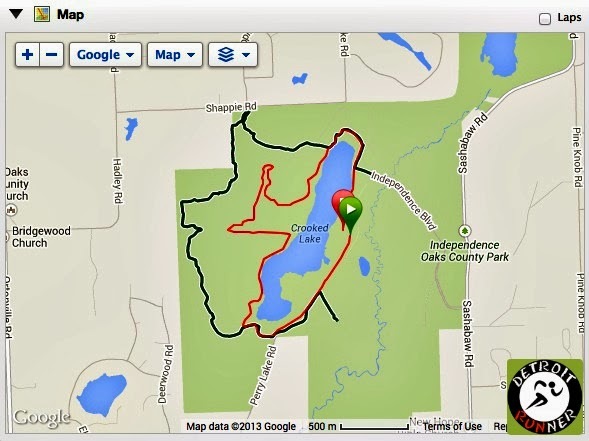 The race was located in Independence Oaks which is an Oakland County park. They had a warming building with two fireplaces going to help keep it a bit warmer than it was outside. It was a brisk 18 degrees with a wind chill of 8 degrees at the start. They had the pickup arranged by last name and was all very organized. After we got our bibs, we hung out inside since it was freezing outside. Most of the other runners had the same idea as you can see below. Since we had a little time, we found the Southeast Michigan Runners group there so we could get a group picture. It's always fun to meet some new runners at events especially this group. Another runner also asked if I was Detroit Runner. I love when people come up to introduce themselves. She said I offer lots of good information on my blog. I'm happy to help! Runnin' Gear had their sign up as well as were selling race shirts. You could purchase a race shirt for $15 if you wanted one and they had several colors to pick from. The picture on the top of this post is the front of the race shirt. I didn't end up buying one but they were nice and they were tech material. 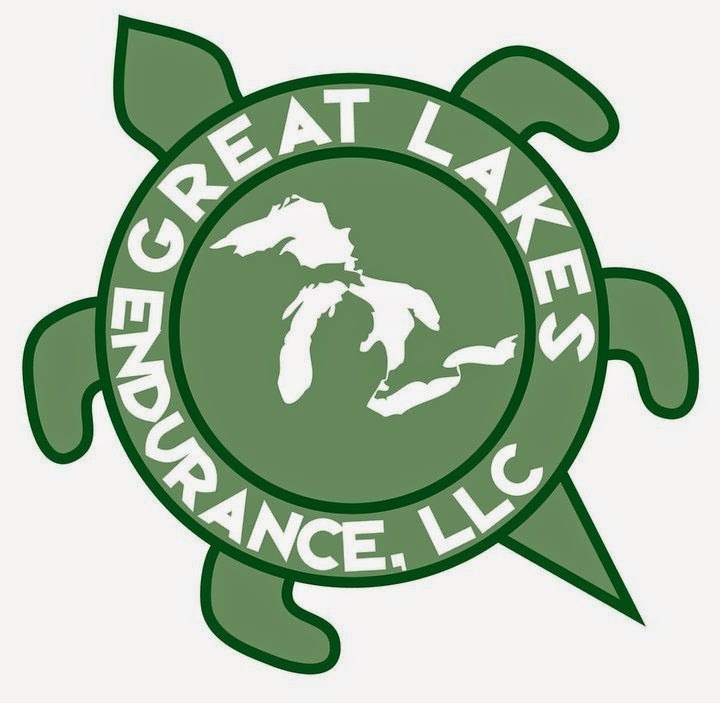 Runnin' Gear - thank you! Before we knew it, it was time to go back out in the cold and race! There were lots of people as you can see by the cars at the event. I was really surprised by how many were there especially given how cold it was outside. We got lined up for the start which was just an area that the race had ready for us to run. No timing mats at the start. The organizers basically said "go" and we were off and running so it was a gun start(not chip start). The chip we had would help them tell us what our time was at the finish. I was really excited to run this 5k since I've not been to Independence Oaks before to run. The race company had the runners set up to run around the lake. The course was 90% trails and grass with a small section in the beginning and end with paved paths. I didn't have any goal for the race. 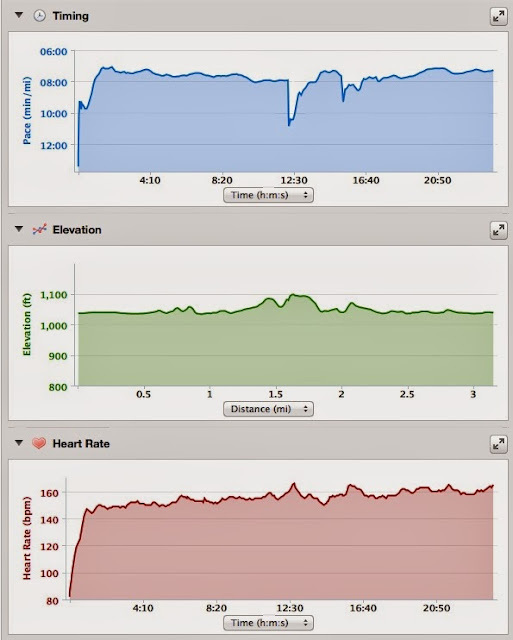 This was just for fun for me since I just ran 10 miles the day before the race. I was just happy to be running a free 5k race. 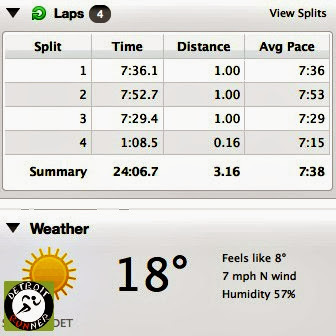 Given that, I still felt pretty good overall and was able to keep a pretty good pace. It was not close to my PR pace but I was happy with the results especially being on the trails and given the hills and the cold weather. Note: When I take pictures during the race, I don't change my pace or stop in the interest of safety(especially on the trails). I just keep running and I get what I can get from the pictures. Some come out better than others but they give you a great idea of what the course is like. As we started, it was fairly crowded for the first 1/4 mile. I followed Josh for this part as he made his way through the crowd weaving around people. The path was fairly wide(you were not on a single track) so you were able to pass people for the most part. After a little bit of pavement, we started on the gravel path. Honestly, bigger gravel is not my favorite surfaces to run on but overall, it was still fairly smooth as you can see in the picture below. It just depended on where you were running on the path. As we made a turn, you could see the lake in the distance. It was a very nice area for a trail run. We came to parts on the trail where it was closer to the lake. This was one of my favorite parts on the course. There were also some hills on the course and the one pictured below was one of the larger hills on the course. Don't let that scare you away - this was a fun course and not that hilly! It also had a few bridges like below. While there's not much to them, I really enjoy running over little bridges like this. We then headed back towards the lake to make our way around the entire lake. Back on the paved path, I used this opportunity to kick it in gear with my last mile being my fastest of the race. We even got to see Santa make an appearance on the course to high five runners. The last tenth of a mile took us back onto the trail and we finished on the grass back near the starting area. The race didn't have an aid stations, but remember, it was a free race and it was only a 5k so you didn't really need anything during it. The race did have refreshments after the race. At the finish line, runners were socializing as they were watching other runners come in. The bathrooms were also right next to the finish line as well. After all of us finished, we made our way back into the warming building to get something to eat and stay warm. 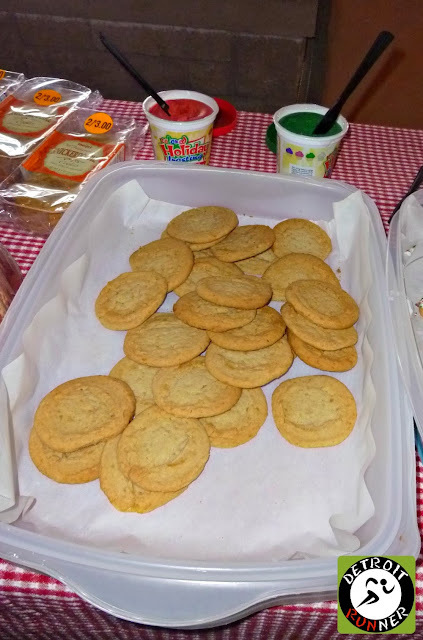 The race offered bananas, oranges, muffins, brownies, and cookies(including homemade cookies). They also offered free hot chocolate. Wow!! 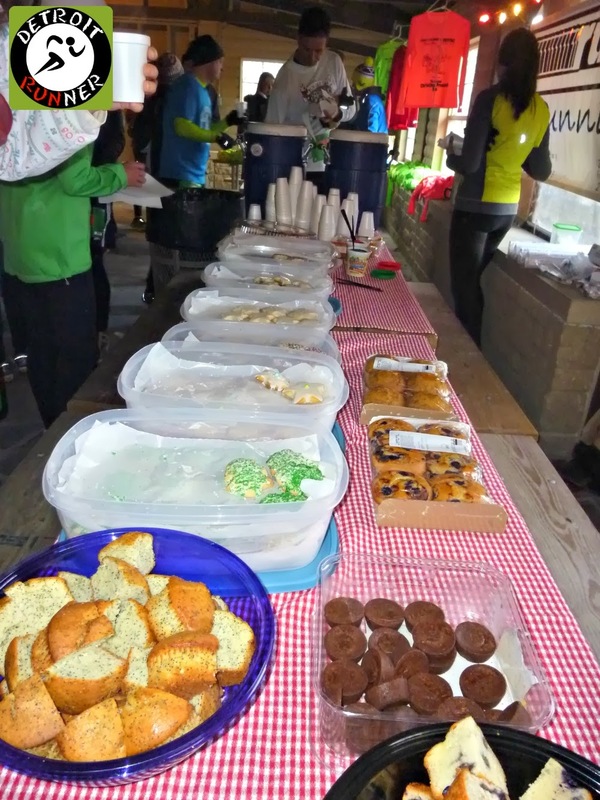 I was not expecting such great after race refreshments for a free race. Runnin' Gear and Rotpac really went all out. The race company even had results up by the time we looked for them and they are posted on RunMichigan. I ended up in fourth in my age group, just 5 seconds short of placing in my age group - darn! 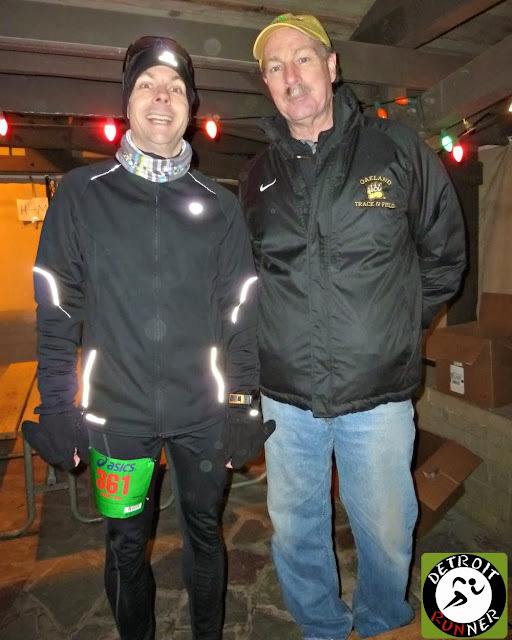 Runnin' Gear owner, Paul Coughlin, announced all the age group award winners and the runners who placed even won gift certificates to the Runnin' Gear store. Wow! How generous! Then he gave away a ton of running items including gloves and women's sports bras, shirts, pants, men's shirts, jackets, shorts, and even shoes! The runners were all pumped to try and win something. My sister in law even got a sports bra and I got a pair of gloves that I gave to her. Bras were flying! You don't see that everyday at a race! For your registration fee of zero dollars, you received a chip timed, well marked 5k race. You received a race bib as well as after race refreshments. You also received an opportunity to win something after the race and from the looks of all the running stuff they gave away, many people walked away with something. The organization was good. Since it was run by a running store and experienced timing company, it made things go smoothly. The race started at 9am and the park opened at 8am. I think the traffic got backed up a bit but the race was able to get everyone in and start the race without losing runners. The course was marked well and it would have been difficult to get lost. The venue for the race was a good place for it given how cold it was so the organization was able to get the runners into somewhere warmer after the race. Overall, what a great time. First off, you can't go wrong with free! I would have been just happy to show up and run the course with other runners. Runnin' Gear went above and beyond and really set this up as a true 5k trail race. Assuming they continue to do this, I know I'll be joining in on the fun in the future. 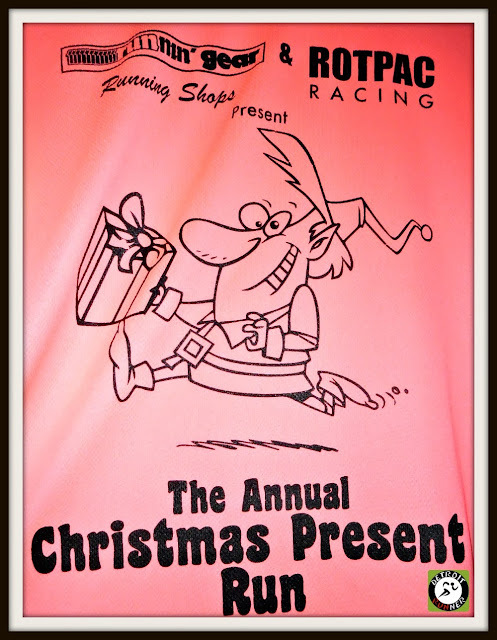 Thanks to Runnin' Gear and Rotpac for putting on this fun, free event. Note: I received no compensation for this post. All opinions are my own. So did you win a sports bra?